Set at an altitude of 5,947 meters, the Kalindikhal Pass on the base of Kalindi Peak, which is at an elevation of 6,102 meters, and surrounded by several other snow clad mountains is the world's highest trekkable mountain pass. The journey en route Kalindikhal Pass unfolds some of the majestic peaks of the Indian Himalayan range. From the cluster of 6 thousanders, the Shivling at 6,543 meters, Meru at 6,630 meters, Kedar Dome at 6,808 meters, Bhagirathi I, II and III at 6,512 meters, 6,454 meters and 6,856 meter respectively, Nilkantha at 6,506 meters, Chandra Parvat at 6,728 meters and Avalanche Peak at 6,413 meters are some of the prominent ones along the trek to Kalindikhal Pass. From the group of 7 thousanders, the Mt. Kamet at 7,756 meters, Mt. Mana at 7,272 meters and Abi Gamin at 7,355 meters are visible during a bright sunny day. Further, the trail cuts through several small gushing streams and passes through the alpine meadows and forest enriched with wide range of Himalayan trees and varied species of Himalayan animals and birds. 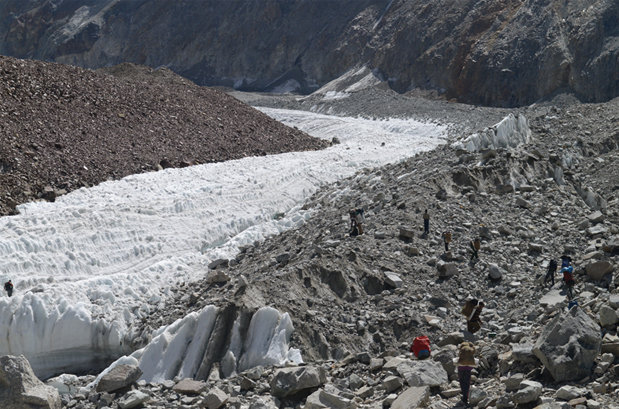 Finally a steep climb leads to dangerous glaciers, which are above 5,000 meters in height like the Suryala Bamak and Sweta. 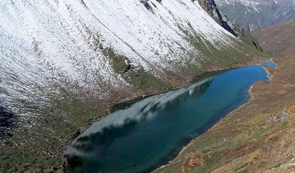 The trek to Kalindikhal Pass also covers some of the high altitude lakes of India, the Vasuki Tal at 4,800 meters approximately and Arwa Tal at 3,910 meters. 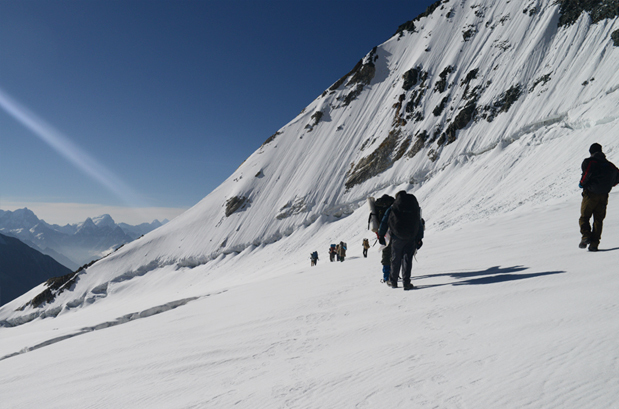 The Kalindikhal Pass trek, which is one of the toughest treks in the Indian Himalayan belt, located in the Garhwal Himalaya, requires acclimatization and prior high altitude trekking experience. Most of the trail goes through a thick bed of snow and cuts through several glaciated and narrow tracks. 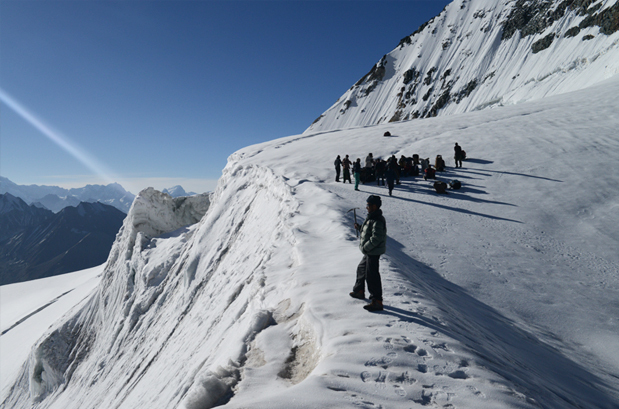 The trek involves the use of ice axe, crampons and fixed rope and thus it is one of the adventurous journeys in the Garhwal Himalayan region. 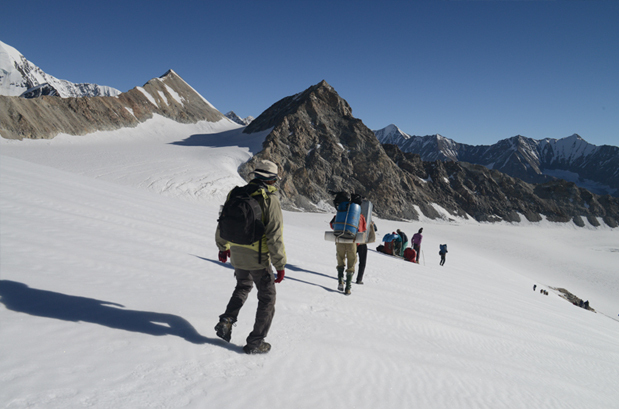 The Kalindikhal Pass trek commences from the Bhagirathi Valley, from an altitude of 3,048 meters at Gangotri, which is one of the major Hindu pilgrimage sites. From Gangotri the trail leads to Bhojbasa, which is at an elevation of 3,792 meters, cutting through a thick alpine bed dotted with wide range of Himalayan trees. Thereafter the trail snakes through the rocky terrain to reach Gaumukh at 3,890 meters. 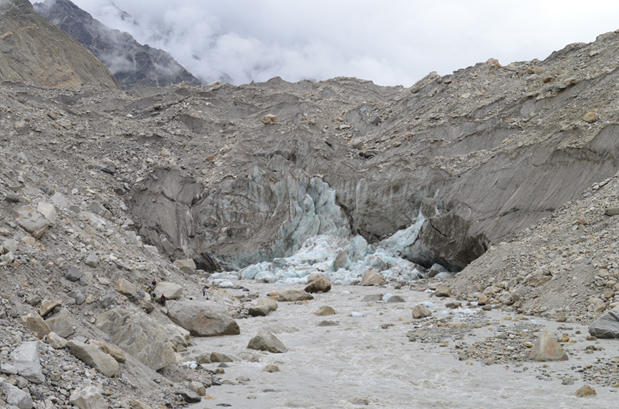 Gaumukh is the mouth of the Gangotri Glacier and the origin point of River Ganga. 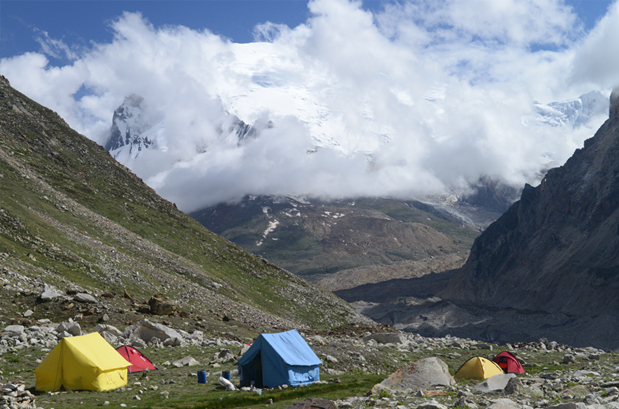 From Gaumukh the trail winds upward to Tapovan, one of the high altitude meadows at an elevation of 4,463 meters and is a picture perfect campsite with the Bhagirathi group of peaks at the backdrop with crisscrossed bubbling streams and dotted with wild flowers. Herds of Bharal (blue mountain goats) are a common sight from here on steep mountain edges. From Tapovan, the journey continues towards Vasuki Tal via Nandanvan, cutting through the glaciated tracks of Chaturangi and glimpse of Meru and Bhrigupanth. From Vasuki Tal the trail starts further strenuous as it steps on to the thick bed of snow and heads to Suralya Bamak at 5,480 meters followed by Sweta at 5,500 meters. Thereafter a gradual climb to Kalindi Base and thence further upward climb to the summit of Kalindi. The downhill trail follows to Arwa Tal at 3,910 meters and thereafter leads off at Mana village via Ghastoli. The Kalindi Pass trekking tour later wheels to Rishikesh enroute Badrinath. 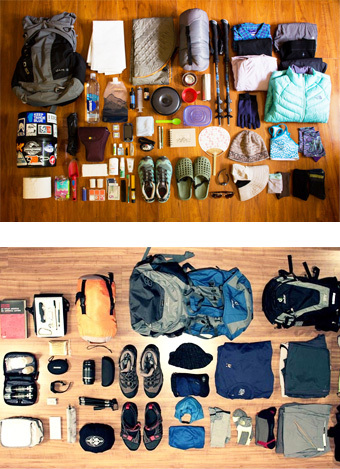 Best time to travel to Kalindikhal trek between summers (mid June) and Monsoon (July to early September). Summers: The weather of Kalindikhal Trek remains pleasant during summers. The Himalayas are distinctly visible and the cool breeze adds charm to the ambiance. Monsoon: The rainfall enhances the beauty of the trek. The forest and meadows become lush green and the flowers outgrow in number. The weather remains moderate and pleasant. The inner line permit is a must for touring in this region. Permit will be issued from District Forest Officer (DFO) Uttarkashi & District Magistrate (DM) Uttarkashi. The copy of the permit, list of the trekkers and guide, cook & porters and the photos should is verified by District Administration of Chamoli (DM of the district and SDM of Joshimath) as well as In Charge of the ITBP camp at Ghastoli as after Gangotri that is the only human settlement. All Trekkers, Guide, Porters, Cook & Helper must be well equipped with the adventure gear like tents, sleeping bag, snow shoes, gloves, rain proof jacket etc. How to Reach Kalindi Khal? By Air: The nearest airport for Kalindi Khal airport is Jolly Grant in Dehradun. The airport is 215kms away from Uttarkashi. By Rail: Haridwar and Rishikesh are the nearest railway stations for Kalindi Khal Trek. From here taxi/cabs are available for Uttarkhashi and further destination. 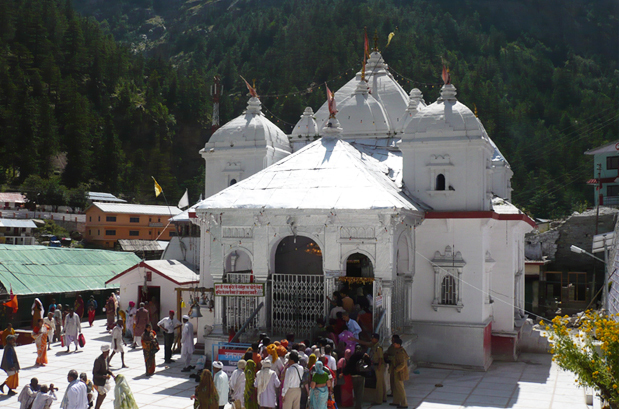 By Road: Uttarkashi can be reached from Haridwar/Rishikesh by direct busses or shared jeeps. It takes about 6 - 7 hours to reach. Buses are available from early morning, and it is advised you leave early to reach early or to give yourself contingency time on mountain roads. In the morning, take an AC train for Haridwar at 06:50 hrs. After arriving in Haridwar, meet our representative who will help you transfer to Rishikesh and check into your hotel. Evening time is free for leisure activities. Overnight stay at the hotel. After the breakfast, we will proceed for Uttarkashi (1150 mts), which takes about 5-6 hrs. Upon arrival, check-in at the hotel. Post lunch, we will visit NIM (Nehru Institute of Mountaineering) Institute & Museum. Later, come back to hotel. Overnight at hotel. Today, we shall spare a day for medical test, permit verification and visit to Nehru Institute of Mountaineering (NIM) etc. Overnight at hotel. Post breakfast, we will drive to Gangotri via Harsil (approx 25 km before Gangotri (3048 mts) in 4-5 hrs. On arrival, check into Hotel/Guest house. Overnight stay in the hotel. 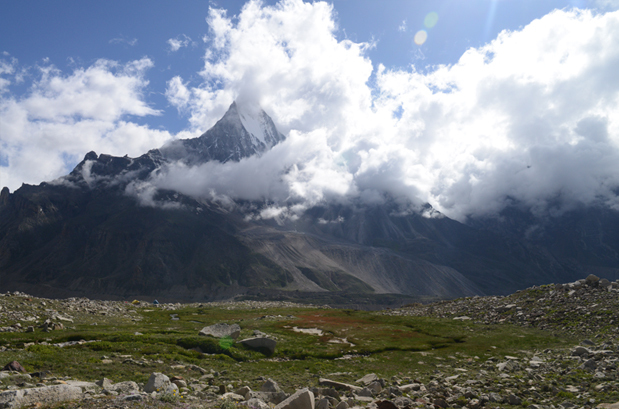 Day 05: Gangotri – Bhojwassa (3792 m/12440 ft) Trek (14 kms /5-6 hrs). In the morning, we will make you meet our trekking crew. Later, after the breakfast, we shall begin our first day trek, which will be to Bhojwassa. The trail is along the river Bhagirathi. 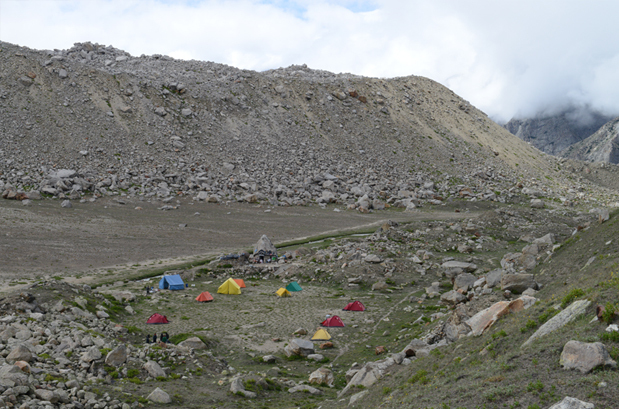 Upon arrival at Bhojwassa, we shall set our camp for overnight stay. 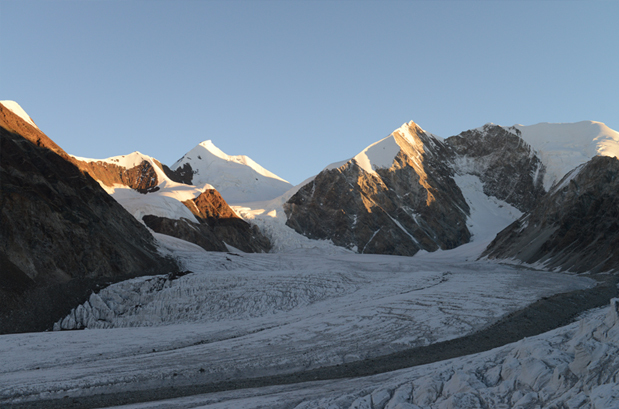 Early in the morning, you will get an opportunity to enjoy the panoramic view of Bhagirathi group of peaks. Post breakfast, we shall trek to Gomukh (3890mt), the source of the Ganges. 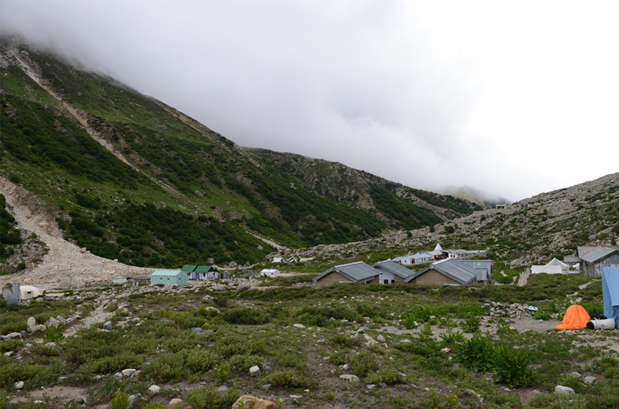 From Gomukh, we will trek to Tapovan, from where a steep ascent begins. Arrive Tapovan and pitch tents. Dinner and overnight stay in camp. We will trek to Nandanvan today. Dinner and overnight stay in tents. Day 08: Nandanvan – Vasuki Tal (4880 m/16000 ft) Trek (6 kms / 4-5 hrs). We shall trek along with Chaturangi Glacier to reach Vasuki Tal today. Vasuki Tal is an alpine lake and is a base for Mt Satopanth and Mt Vasuki Parbat. The trek is steady and upward. It will take around 5-6 hours to reach Vasuki Tal. Overnight stay in tents. Day 09: Vasuki Tal – Khara Pathar (Suralya Bamak) (5480 m/17975 ft) Trek (6 kms/3-4 hrs). Day 10: Khara Pathar – Sweta Glacier (8 kms / 4-5 hrs). After the breakfast today, we shall trek 10 Km to reach Sweta Glacier (5500 mts). Dinner and overnight stay in the camp. After having the breakfast, we will set out for Kalindikhal camp. Overnight stay in tent. In the morning, we shall set out for Kalindi peak summit. Overnight stay in tent. Day 13: Kalindikhal - Raja Parav (4910 m/16105 ft) Trek (12 kms / 6-7 hrs). After the breakfast, we will proceed to Kalindi Pass (5947 mts). Spend some time at the spot and then trek down to Raj Parav for dinner and overnight stay in the camp. Today, we shall proceed towards Arwa Tal (3910 mts), which is 13 km from Raj Parav. Overnight stay in the camp. Day 15: Arwa Tal – Ghastoli (3796 m/12450 ft) Trek (16 kms / 5-6 hrs). Our trekking will be towards Ghastoli (3796 km) today, which is 16 Km from Arwa Tal. Dinner and overnight stay in the camp. Day 16: Ghastoli - Mana – Badrinath (3096 m/10155 ft) Trek (18 kms / 5-6 hrs). Today, we will trek to Badrinath, which is situated on the bank of Alaknanda River. A seven-hour walk brings you to Mana Village, the last village of India. After having lunch here, we will drive to the town of Badrinath. On arrival, check into the hotel. 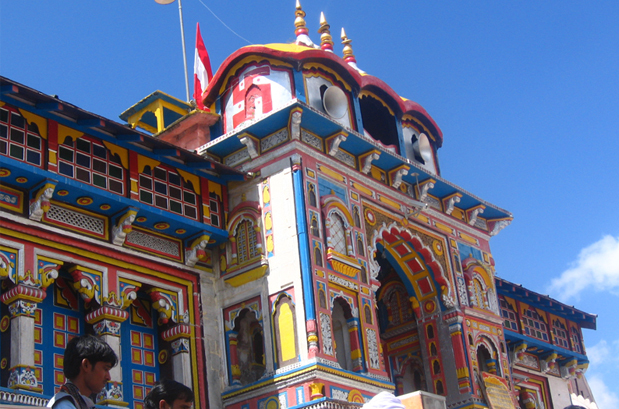 In the afternoon visit the temple of Badrinath. Return to hotel for dinner and overnight stay. After the breakfast, drive (290 km) down to Rishikesh. On arrival, check-in to the hotel. In the evening, visit Laxman Jhula, Thirteen storied temple, Geeta Ashram, Parmarth Niketan and later join the Aarti ceremony at Triveni Ghat. Return to the hotel for overnight stay. In the morning, transfer to Haridwar Railway Station and from here catch AC train for Delhi at 06:30 hrs. Arrival at Delhi by 11:45 hrs. Neckerchief, sunglasses, sun block lip balm. 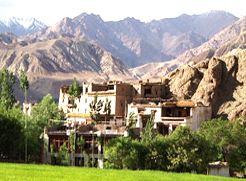 When to book Kalindi Khal Trek? 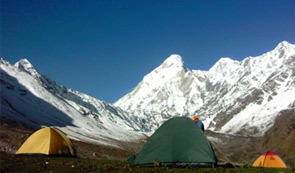 You should book Kalindikhal trek well in advance so that you get ample amount of time to prepare for the trek. Our pick up and drop point for Kalindi Khal Trek is New Delhi train station at platform no. 16. We will hand over the tickets to you and then pick you up at Haridwar Railway Station from there your tour will start. Our group size is minimum 4 people and maximum 8 people with mix of men and women. What is minimum age required for Kalindi Khal Trek? 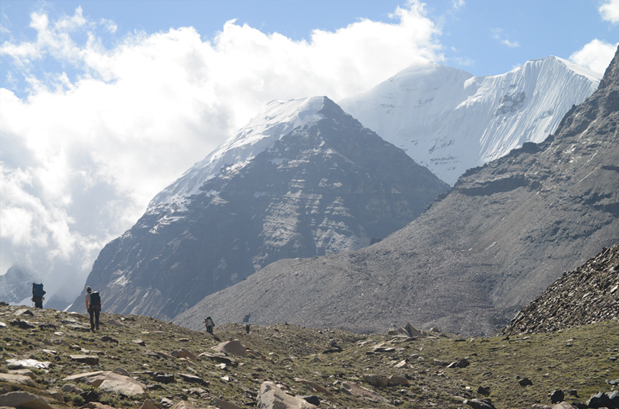 Kalindi Khal is a tough trek with a maximum altitude of 5946 m/19500 ft, so the minimum age required is 18 years. 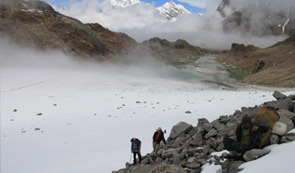 What will be the minimum temperature during Kalindi Khal Trek? 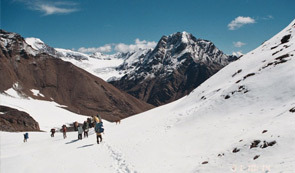 In the month between June and August the temperature during the trek can go as low as -8 Degree Celsius during the night and the day time it increases to 10-15 degree at high altitude. 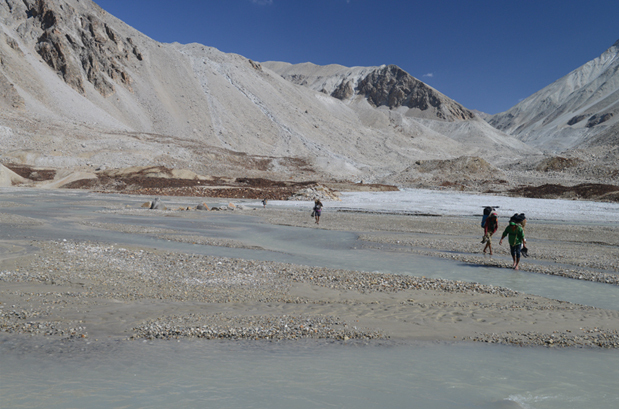 How long we trek during Kalindi Khal Trek? 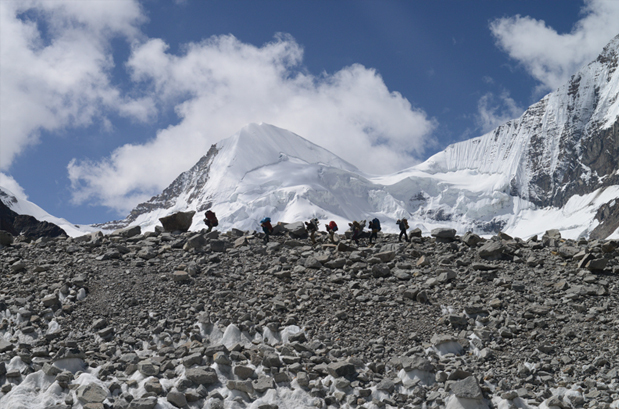 We plan our treks in a way that after 6-7 hours of trekking we can reach next camp around the lunch time. Normally, 10-15kms per day of trekking is required. How monsoon affects the Kalindi Khal Trek? Kalindikhal trek is open in the months of June, July and August, which are the full monsoon months as the high altitude regions remain unaffected from the monsoon.